As part of our Sesquicentennial Celebration, the 150th committee wants to recognize early pioneers (prior to 1900) and their descendants during the Community Picnic on March 26. Committee members Ben Warren & Polly Schuster have been tasked with finding descendants. If your ancestor lived in the Titusville area (Titusville, Mims, Scottsmoor, etc) prior to 1900, the Titusville 150th Anniversary Committee wants you. We are collecting names of direct descendants still in the area. The descendants and pioneers will be recognized at the Community Picnic on March 26. 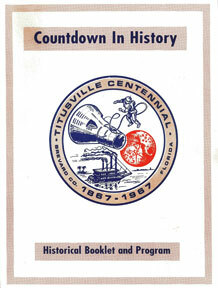 2017 is Titusville's 150th anniversary, our sesquicentennial. We are planning lots of things, one of which is an old-fashioned picnic on March 26. During the picnic, we want to recognize early pioneers (settled in the area prior to 1900) and their direct descendants. Back to the 150th Anniversary website.